600 Watt DC to AC pure sine wave power inverter is available for optional DC input 12/24/48 Volts and AC output 110/120/220/230/240 Volts , used for car, home and solar, with full protection against overload, overheat, low voltage, over voltage and short circuit, built-in fuse and cooling fan. DC to AC pure sine wave power inverter outputs 5000 watt continuous power and 10000 watt peak power, input DC 12/24/48 volts, and output AC 110/120/220/23/240 volts, with universal AC outlets and USB port, digital LED display, high conversion efficiency and reliability. 600 Watt pure sine wave power inverter are on sale, optional DC input 12V/24V/48V and AC output 110V/120V/220V/230V/240V. Low price, high efficiency and factory direct sale. Inverters are used to convert DC energy (batteries) into AC power, and it consists of an inverter bridge, control logic, and a filter circuit. It is widely used in air conditioner, home theater, electric grinding wheel, electric tools, sewing machines, DVD, VCD, computers, TV, washing machines, range hoods, refrigerators, video recorders, massagers, fans, lighting and so on. Besides, when you drive to work or travel, the car inverter works which can be connected to the batteries or car cigarette lighter to energize the electrical appliances. The powers of car inverter output via the cigarette lighter have 20W, 40W, 80W, 120W, and 150W. 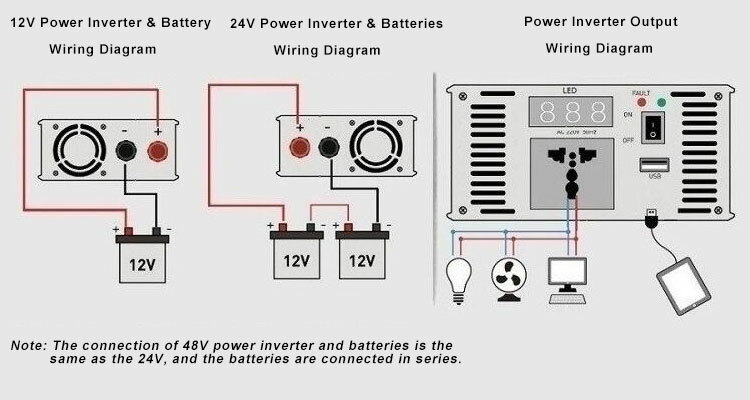 For the larger power like 300W, 500W, 600W etc., the power inverters need to be connected to the battery via the cable. Thus, the home appliances can work as they are connected to the output side of the power inverter, such as cellphones, laptops, digital cameras, lights, electric razors, CD players, game consoles, PDAs, power tools, car refrigerators, and various travel, camping, medical emergency appliances. How long does the power inverter work? Note: 0.8 is the number of battery discharge (Normal); 0.9 is the efficiency of power inverter (Normal). Of course, the actual working time is also related to the conditions of the battery.